Stahlman's Gorge is a small cave located far west of Mortrag Glacier. 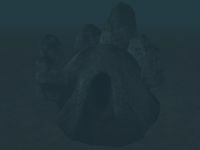 You find this underwater cave off a small island by following a special horker, The Swimmer, in the Ritual of Water quest. It is almost completely filled with water except for the small air pocket at the end. A Skeleton Berserker guards a potion with the Waters of Life. The Ritual of Water: Seek the Water of Life. This page was last modified on 10 January 2019, at 23:52.